The scriptures are a record of God’s teachings and dealings with His children. A scripture journal is your own book where you can write how you are learning to understand and live the teachings of the gospel. Every month this year you can learn a scripture and practice doing what it teaches. Heavenly Father will help you as you choose to learn and live by the scriptures. You will feel the power of the scriptures, and your testimony will grow. Make or buy a notebook that has at least 12 pages in it. Issues of the Liahona this year will contain a scripture and activities for you to do in your scripture journal. If you need help reading, writing, or understanding the scripture or activity, you can ask parents, older brothers or sisters, friends, or Primary teachers for help. Read the first article of faith. You can find it in the Pearl of Great Price. Pray to know that this article of faith is true. Ask to feel the love of Heavenly Father and His Son, Jesus Christ. This love is called charity. Memorize the article of faith. Help someone else learn this scripture. Pray for someone else to feel God’s love. When we feel the love of Heavenly Father and Jesus Christ, we believe in Them. We believe that we are children of God. We show that we believe He is our Heavenly Father by thanking Him for our blessings. When you see your doorknob tag (see page 67), think of the blessings you have received that day. Write in your journal about what you have done, or draw a picture of how you feel knowing Heavenly Father and Jesus love you. Cut out the doorknob tag below. Fold the doorknob tag on the dotted line. Think about the blessings Heavenly Father has given you, and write some of them on the list. Hang the doorknob tag where you will see it often. 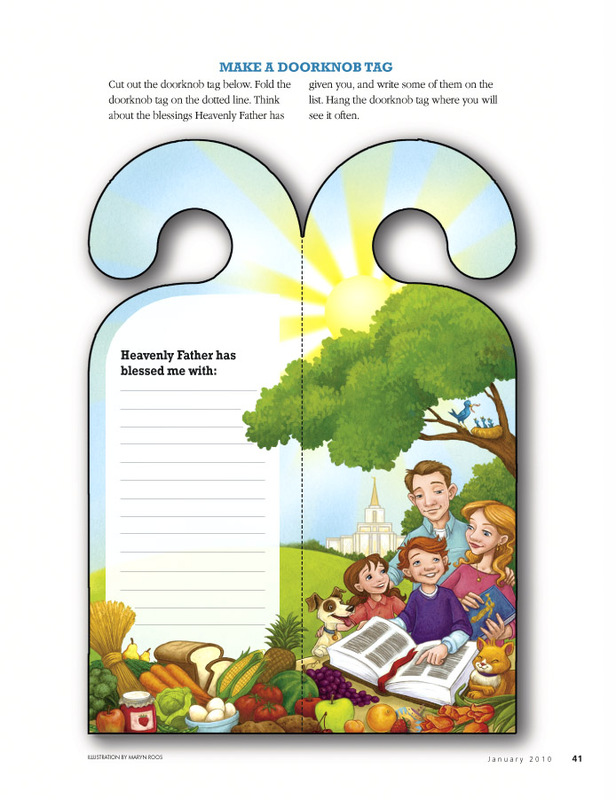 “Scripture Power,” 2006 Outline for Sharing Time and the Children’s Sacrament Meeting Presentation, 10–11.